kent as the Master o Boucicaut (1412). 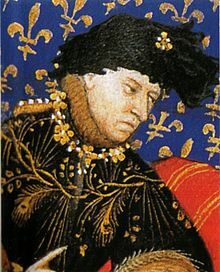 Charles VI (3 December 1368 – 21 October 1422), cried the Beloved (French: le Bien-Aimé) an the Mad (French: le Fol or le Fou), wis Keeng o Fraunce frae 1380 tae his daith. This page wis last eeditit on 13 Apryle 2019, at 16:48.